Right at our doorstep is one of the most fascinating and watched creatures in Canada: our flying feathered friends. There is nothing that says, or better yet, sings nature than the sound of birds. While many birds call Canada home year-round, our country welcomes millions of migrating birds every year during spring. Across the country, each province and territory has not only a variety of bird species, it has an official bird. These regions recognize the birds as emblems that capture the essence of the nature, wildlife and character of each province and territory. 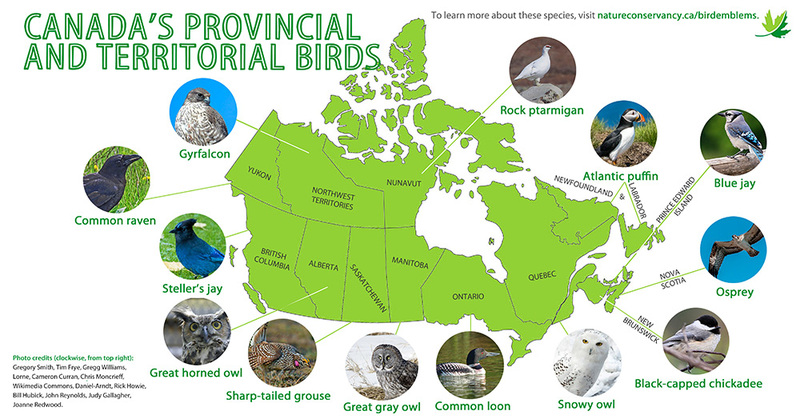 Discover your province or territory’s official bird below. Description: A songbird with a black head, legs and upper breast and back. Feathers on the body, including belly, lower back, tail and wings are a deep blue. 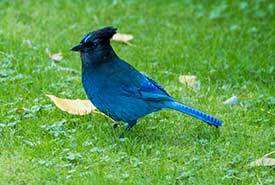 Habitat: Found throughout southern BC and western Alberta, the Steller’s jay primarily inhabits coniferous forests, but can also be found in mixed forests. 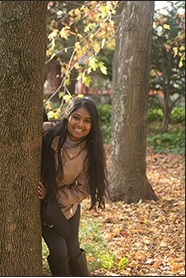 In wintertime, residential areas, open woodlands and forest edges provide habitat for this bird. Interesting fact: The Steller’s jay is expert at mimicking the sounds of birds, dogs, cats and squirrels. Description: A large owl with distinguishable feathered tufts, known as “plumicorns” on its head. 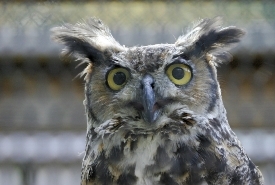 The great horned owl has a curved beak and a brown or grey-brown body, with white patches on its throat. Its enormous yellow eyes, with pupils that open wide in the dark, allow it to hunt at night. Habitat: A habitat generalist, this owl can be found in grasslands, coniferous and deciduous forests, tundra edges, wetlands, deserts and suburbs. They usually include some areas of open habitat within their range. Interesting fact: Great horned owls can see in any direction, even though their eyes do not move in their sockets, because they can rotate their head 180 degrees. Description: Medium- to large-sized chicken-like birds with prominent short, pointed tails. Their tail feathers are light brown with white edges. The bird has white underparts and is spotted white and brown, and marked with bands of dark brown and black along its upperparts. 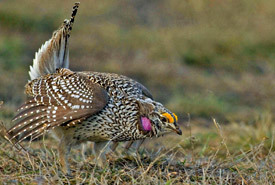 Habitat: Lives mainly on grasslands. The bird lives year-round in Saskatchewan. Interesting fact: Males perform elaborate courtship rituals to attract females. Description: A large, tall owl with a big head, round face, tiny bill, yellow eyes and broad, rounded wings. Great gray owls are silver-grey in colour, with patterns and streaks of brown, grey and white along their body. Wingspans can reach up to 1.5 metres. Habitat: Inhabits dense coniferous forests with nearby open areas for hunting. 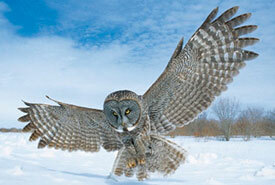 Interesting fact: Great gray owls have directional hearing, which helps them hunt for prey through sound alone. They have asymmetrical ear openings: the right ear opening is lower on the head than the left. This helps them to sense exact prey locations. Description: A large, diving water bird with a long body and short tail. Common loons have characteristic red eyes and thick straight bills. The loon has a green to black coloured head and neck, a white- and black-spotted back, and a white necklace around its throat in summer. 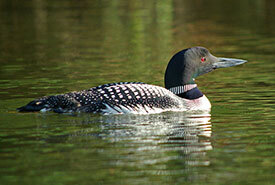 During winter, the non-breeding season, common loons have grey feathers, along with a grey head and bill. Habitat: Lives on lakes, with a preference for clear lakes in order to see prey under water. Most of Ontario’s loons winter along the Atlantic and Gulf coasts. Interesting fact: Pigment in the loon’s retina, which is why its eyes are red, filters light and allows for below-water vision. Conservation status: Not at risk in Canada but on the Watch List in the 2016 State of North America Birds. Description: A large owl with yellow eyes, a round head and bulky body of white feathers, with varying amounts of black or brown markings. Females have more markings than males. Habitat: Occupies wide-open spaces and treeless areas. It breeds in the tundra (a treeless flat Arctic region with frozen subsoil), and often migrates to southern Canada during the winter, where it hunts in prairies or open fields. 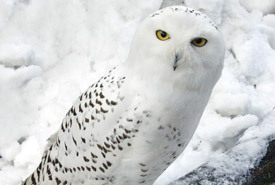 Interesting fact: Unlike other owls, snowy owls hunt day and night. 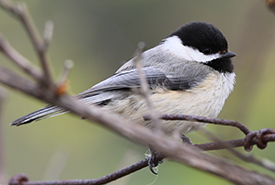 Description: A small bird with a round head and short neck, black-capped chickadees have white cheeks, a black cap and bib, grey feathers along their back, white stomachs, and tails and wings that are grey with white edges. Habitat: Lives in any habitat type with trees, including parks, mixed and deciduous forests and residential areas. Nests in tree cavities and bird houses. Interesting fact: This bird hides its food to eat later and remembers where its stashes are. Each food item is hidden in a different spot. 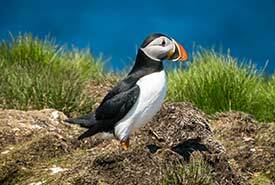 Description: Distinctively coloured triangular beaks, red and black markings around the eyes, orange webbed feet, and black and white waterproof feathers mark the Atlantic Puffin. During the winter season, the seabird’s beak and feet shed and the markings around the eyes disappear. Habitat: Can be found in the rocky cliffs, grass slopes and shorelines of the North Atlantic Ocean region, where it nests and breeds in colonies on isolated islands. The Atlantic puffin spends winters out on the open ocean. Interesting fact: The Atlantic puffin flaps its wings at 300 to 400 beats per minute. Description: Large raptors with slender bodies, hooked beaks, sharp talons and long wings and legs. The bird has dark brown feathers on its upperparts and white feathers on its underparts. Its head is mostly white, with a brown streak through its eye. Habitat: Lives near bodies of water, such as shorelines of rivers and lakes. Interesting fact: Osprey’s dive into the water and catch live fish. 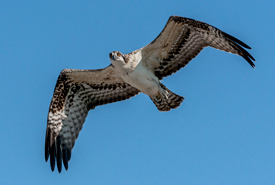 When in flight, the osprey’s wings make an M-shaped when viewed from below. Description: A large blue- and black-winged songbird with a white face, thick black beak, rounded tail and black legs and feet. Wing feathers are blue with white and black bands and its underparts are white or light grey. Habitat: Occupies forested areas, particularly mixed and deciduous forests with oak trees. 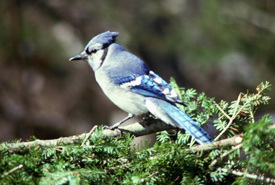 Blue jays can also be found along forest edges and in urban areas. Interesting fact: While many individuals remain in Canada year-round, large flocks migrate south each fall. 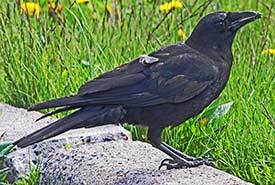 Description: Largest member of the crow family, measuring up to 70 centimetres in body length. Entirely black, common ravens have a thick neck, sharp beaks, thick unkempt throat feathers and narrow wings. Habitat: Can be found in any habitat type, including mountains, grasslands, coniferous and deciduous forests, tundra, deserts and rural areas. Interesting fact: Common ravens are outstanding fliers and can perform acrobatics, including rolls and somersaults, in the air. Description: Gyrfalcons can measure up to 64 centimetres in length, with a wingspan of 123 centimetres. The bird has a thick body, spotted underparts, a long tail and pointed wings. It ranges in colour — white, grey and dark brown — and is marked with bands of these colours on its back, wings and tail. Habitat: During breeding season, they occur in northern Arctic and alpine habitats, such as rocky outcrops, river bluffs and rocky sea coasts. In winter they can be found further south in grasslands, coasts and other open areas. 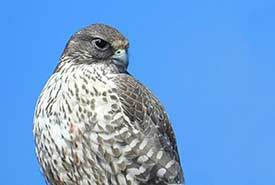 Gyrfalcons are found near areas rich with food sources. Interesting fact: The gyrfalcon is the largest falcon in the world. Description: An Arctic bird with a thick, round body, a comb of red above its eyes and a short black tail. In winter, the bird is completely white, except for its tail. During summer, it is a grayish brown. 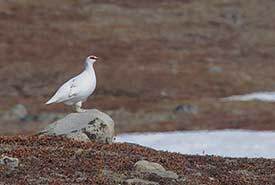 Interesting fact: Rock ptarmigans have feathered feet, which helps them walk in the snow. 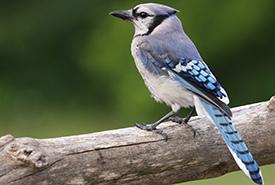 You can enjoy exceptional birding at some of the Nature Conservancy of Canada’s (NCC) Nature Destinations, such as North Bear Alvar in Ontario, Dutch Creek Hoodoos in British Columbia or Jean-Paul-Riopelle in Quebec. Nature Destinations feature some of our country’s greatest natural areas and invites you to connect with nature.